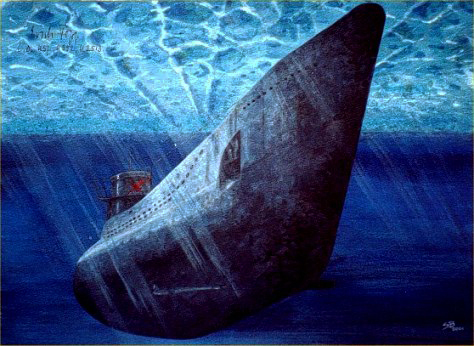 Original picture is acrylic on paper measuring 21"x 16"
This is a painting of WW2 U-boat U552. Although there were over 650 type VIIC U-boats, similar to this one, that served during the Second World War this particular U-boat is easily identified by the insignia of the red devil on the conning tower. Commissioned in Dec 1940 U552 was put under the command of one of the war�s most well-known commanders, Erich Topp. Later, it was commanded by Klaus Popp and then Gűnther Lube. In total U552 completed 14 patrols and sank over 150 GRT of allied shipping before being transferred to Wilhelmshaven, Germany, as a training boat. It was scuttled by her crew in May 1945. �Erich Topp's Red Devil� is painted in acrylic on paper measuring 21� x 16�. The original painting has been autographed by Erich Topp. He has simply signed his name followed by C.O. U57, U552, U2513. 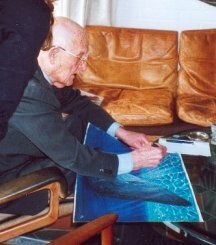 The highly collectible Limited Edition prints also show the commander's autograph but please note that the prints are not individually signed by Herr Topp, the signature on the prints are replicated from the original painting. However, the prints are individually signed and numbered by the artist.